SALVIATI. We resolved to meet today and discuss the differences in the FCC’s approach to the potential for harmful interference between broadcast and mobile services in the 600 MHz band on the one hand and the lower 700 MHz band on the other. To prevent harmful interference between broadcast and mobile services in the 600 MHz band, the FCC has proposed separating these services with guard bands in which neither service would be allowed to operate. To make this easier to understand, let us use this tablet to illustrate the FCC’s proposed 600 MHz band plan and other such matters as they arise during our discussion. The FCC adopted a very different approach to this issue in the 700 MHz band. Rather than require a spectral guard band between broadcast and mobile services, the FCC created geographic exclusion zones to protect broadcast services from the potential for harmful interference from mobile services in the lower 700 MHz A Block. The FCC considered imposing additional limitations to protect mobile services in the A Block from broadcast services in Channel 51, but ultimately decided to provide A Block licensees with the flexibility to account for harmful interference through their own business plans, services, and facilities. Band Class 12, which has no guard band. A group of A Block licensees subsequently filed a petition asking the FCC to initiate a rulemaking proceeding to require that all devices operating on paired commercial spectrum in the 700 MHz band be capable of operating on all paired frequencies in the band and also to suspend authorization of 700 MHz devices that are incapable of operating on all such frequencies. Last year the FCC initiated a rulemaking proceeding to evaluate whether the lower 700 MHz B and C Blocks would experience harmful interference, and to what degree, if the FCC were to impose an interoperability mandate. It would appear that the FCC has since answered the first question, whether eliminating the de facto guard band in 3GPP Band Class 17 would cause harmful interference, by proposing 6 MHz guard bands between broadcast and mobile services in the 600 MHz band. SIMPLICIO. The 600 MHz band uses different frequencies than the 700 MHz band, and different frequencies have different characteristics. The FCC has often adopted different rules for different frequency bands. If the potential for harmful interference between broadband mobile services were similar in both bands, the FCC would not have omitted that fact. SAGREDO. You might at least add, “if it had occurred to the FCC to consider the question.” If the FCC were to consider it, could the FCC plausibly conclude that the potential for harmful interference between broadcast and mobile services is substantially different in the 600 MHz band? SALVIATI. Your question seems to me most excellent. Though I grant that the FCC adopts spectrum rules on an ad hoc basis, I feel no compulsion to grant that the arbitrary distinctions of FCC process confer legitimacy on question of physics. Whether the potential for harmful interference is substantially the same in the 600 MHz and 700 MHz bands is a question amenable to answer only by demonstrative science, not speculation regarding past FCC actions and current omissions. Neither the FCC nor the industry has adduced any evidence that the potential for harmful interference varies substantially between the 600 MHz and 700 MHz bands. To the contrary, the available evidence indicates that the potential for harmful interference in these bands is substantially similar due their relatively close proximity within the electromagnetic spectrum and the fact that the phenomena responsible for interference between broadcast and mobile services are not frequency dependent. SIMPLICIO. I do not mean to join the number of those who are too curious about the mysteries of physics. But as to the point at hand, I reply that licensees in the A Block are asking the FCC to impose an interoperability mandate for competitive reasons. 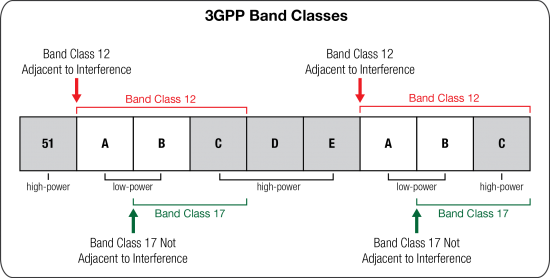 AT&T, who owns spectrum in the lower 700 MHz B and C Blocks, has deployed only Band Class 17, which excludes the A Block. Licensees in the A Block must use Band Class 12, which is not supported by AT&T. That is preventing A Block licensees from taking advantage of AT&T’s economies of scale for purchasing devices and roaming on its network. This seems to be conclusive evidence that AT&T excluded Band Class 12 from its B and C Block devices to raise the costs of its rivals, a form of anticompetitive behavior. SAGREDO: I do not claim to comprehend the mysteries of physics, but I have some knowledge of the laws governing competition. The law does not penalize a company merely for being successful in the marketplace – it prohibits only anticompetitive behavior that is “unreasonable” or “wrongful.” The fact that AT&T’s decision to deploy Band Class 17 may incidentally raise its rivals’ costs is irrelevant if AT&T had legitimate business reasons to make that decision. SALVIATI. Exactly so, which brings us full circle. Whether AT&T had legitimate reasons to deploy Band Class 17 depends on the laws of physics. 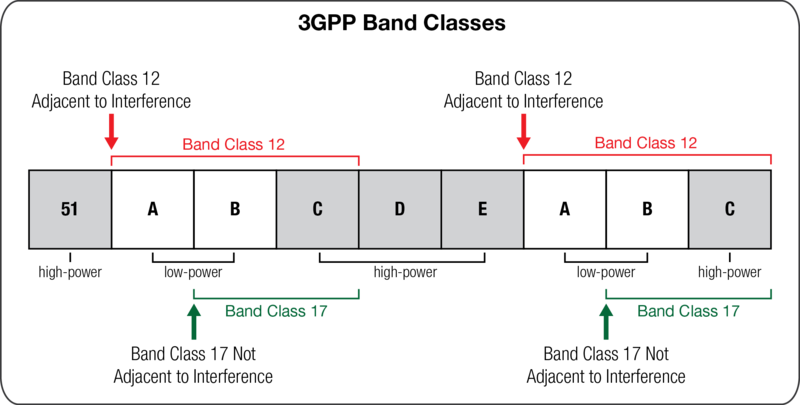 If deploying Band Class 12 has the potential to cause harmful interference to the B and C Blocks, AT&T’s decisions to deploy Band Class 17 cannot be considered anticompetitive. SIMPLICIO. What about the expectations of the A Block licensees? Band Class 17 was not proposed to the 3GPP until after the 700 MHz auction was completed. It seems legitimate to me that the FCC honor their expectation that all licensees would deploy Band Class 12. SALVIATI. Another question answers yours. Did the FCC require or even encourage the deployment of interoperable devices in the 700 MHz band? SIMPLICIO. You already know the answer. The FCC clearly said licensees could make their own determinations respecting the services and technologies they deploy in the band so long as they comply with the FCC’s technical rules. What does that have to do with the expectations of the A Block licensees? SALVIATI. It demonstrates that the ostensible expectations of the A Block licensees were unreasonable. The FCC’s rules clearly gave B and C block licensees the absolute right to eschew deploying Band Class 12, and it was reasonably foreseeable that B and C Block licensees would exercise that right given the potential for harmful interference inherent in Band Class 12. Based on the FCC’s rules, the ostensible expectation of the A Block licensees is more reasonably categorized as a blind hope or a calculated risk. On average, the A Block licensees paid less than half the price the B Block licensees paid for the same amount of spectrum. If the B Block licensees had decided to deploy Band Class 12, the A Block licensees would have enjoyed access to maximal economies of scale while the B Block licensees suffered from the same interference potential at twice the price. If not, the A Block licensees knew that they could still deploy Band Class 12 on their own at half the price. SIMPLICIO. You say the A Block licensees could still deploy Band Class 12 systems in their spectrum, but they say they cannot deploy without AT&T’s help. Why should I favor your position over theirs? SALVIATI. Experience proves my position is correct. US Cellular, one of the A Block licensees who petitioned the FCC in this matter, has already deployed Band Class 12 in its A Block spectrum. SAGREDO. I cannot without great astonishment – I might say without great insult to my intelligence – hear it said that something cannot be done that has already been done. I submit that I am better satisfied with your discourse than that of the A Block licensees in respect to the competitive and economic issues. But my knowledge is insufficient to reach my own conclusion regarding the physics. Perhaps AT&T was acting unreasonably when it chose to use the A Block as a de facto guard band to protect its operations in the C and B Blocks from harmful interference. SALVIATI. That is the question Simplicio dreads. He knows that, if the FCC answers that question in the affirmative, it cannot establish guard bands in the 600 MHz band. The law governing the 600 MHz band provides that “guard bands shall be no larger than is technically reasonable to prevent harmful interference between licensed services outside the guard bands.” It can hardly be technically reasonable to require a 6 MHz guard band in the 600 MHz band while finding it was technically unreasonable for AT&T to treat the 6 MHz A Block as a de facto guard band given the evidence that the interference potential is substantially the same. SAGREDO. Let us close our discussions for the day. The honest hours being past, I think Simplicio might like to contemplate this question during our cool ones. Tomorrow I shall expect you both so that we may continue the discussions now begun.